Mirimar gave the Ballymore Down Under Syndicate a second winner in a week with an impressive victory at Lingfield on Saturday. Trained in Newmarket by Ed Vaughan, Mirimar came home one length clear at the end of the Galway Festival Betting Handicap over a mile and a quarter. Adam Beschizza settled Mirimar in behind the leaders and then began to get busy two furlongs out. Mirimar found and ran to the lead inside the final half furlong and stay on too well for Velvet Voice. A three-year-old son of Kalanisi, Mirimar relished the step up in trip and his trainer feels he can improve even further. Mirimar’s win follows the victory of Swaffham Bulbeck at Nottingham on Thursday for the Down Under Syndicate. 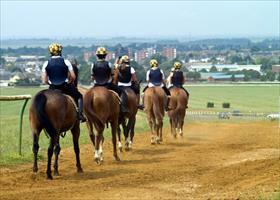 We would love you to join us racing horses in England. Contact Anthony Feroce to find out how to get involved.